The first issue of Reflekt was when I was in the last half of my senior year in college. I wrote 3 interviews of 3 girls who really inspired me with their personal style and life story, a ‘makeover’ feature, and 3 obscure LA spots everyone should go to! Issue º8 (coming out around LA zinefest time) features 3 muses one being Simon Sotelo (Co-founder of LA Zine Fest),theatrical photographer Franz Szony and eccentric artiste Erika Bijeljic. Style tricks we learned from homeless. 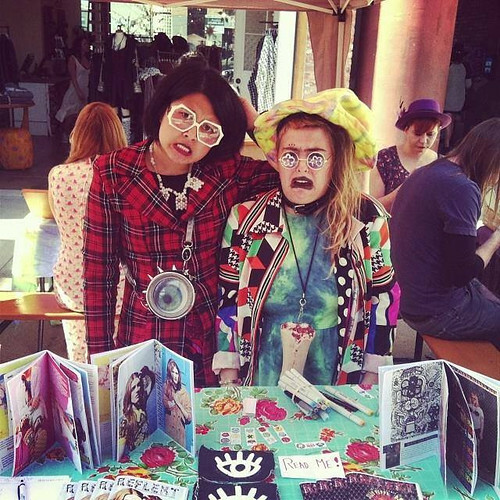 Evil politicians and their amazing personal style, Style tribe feature with LA crafty girl gang The Squirrel Scouts. And articles inspiring you to be your wonderfully weird self! Of all the things you’ve ever made, zine-related or otherwise,what’s your one favorite? My first issue of Reflekt is my favourite zine thing, and my emerald and gold painted ‘Hand'(made of baby doll hands) rack I made for my necklaces is my other favourite! 3. Diana Vreeland- most eccentric fashion mag editor-in-chief. She taught me to let my imagination run wild. I love watching classic or visually stylized movies, make my own clothes, read my favourite blogs, creative books and magazines, tumblring and going to cute cafes. I think it all helps inspire me for ideas for Reflekt and to improve on myself. But sometimes I watch too many movies, or read too much or go on Tumblr WAY too much so that’s harmful as I lose track of time. Its all about balance I suppose. Check out Reflekt Mag online!